Expect a revision of the list in 2018, so the map may look different after additional sighting reports are added. Why publish a press release now, when the sighting list is not yet complete? It will never be complete, for people continue to encounter these featherless flying creatures in the USA, but the public needs to know what is flying overhead in North America and in Hawaii, and they need to know it now. The list itself is not in that press release but it was written based upon what I discovered from comparing the number of sightings with state populations. 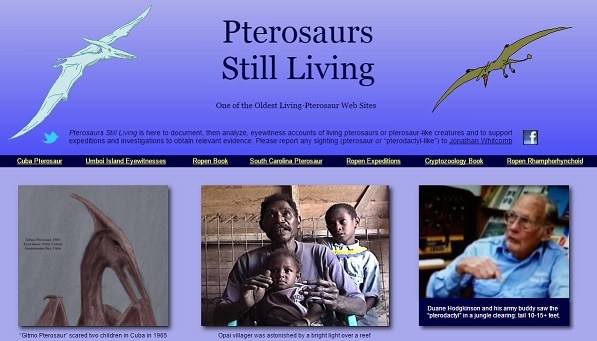 These 161 reports are only a tiny fraction of the actual encounters American have had with apparent living pterosaurs over the past few decades. The actual number could be a thousand times that many. In other words, this sample may be too small to draw many conclusions about where in the USA non-extinct “pterodactyls” are more common. It may give us a hint about human nature, however. 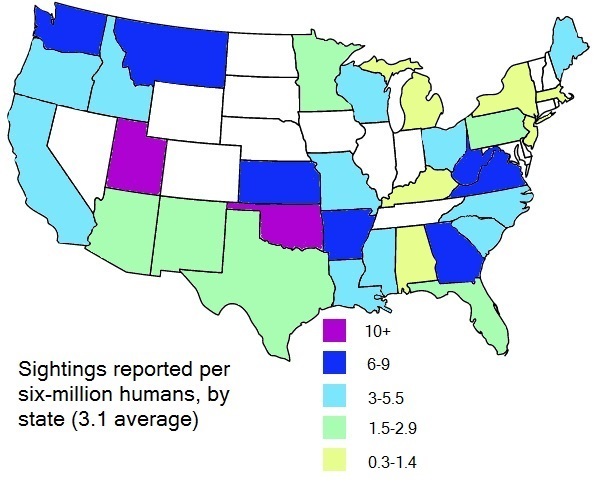 The top eight states, in relation to human populations, for reported pterosaur sightings are as follows, with actual number of sightings in parenthesis. The numbers on the right are reports per six-million human residents or the equivalent in ratio. The numbers on the right are for comparing the number of reported sightings per six million persons. Since the populations of Virginia and Georgia are more than six million each, the number of reports are greater than the numbers on the right. In other words, if six million people lived in Virginia, then the number of reports would have been seven or eight (7.5). The actual number of reports from Virginia, however, is ten, for the actual number of people living in Virginia is over eight million. Why are Sightings Reported so Frequently in Hawaii? I’ve noticed, over the years, that some reported sightings of flying “pterodactyls” come from eyewitnesses who seem to spend more time outdoors than the average person. It could be when they’re driving or riding as a passenger in a car. Some of the other eyewitnesses were watching the stars at night or just enjoying a beautiful outdoor scene. Hawaii is a perfect place to look around outside, so we should not be shocked that sighting reports are more numerous from that state. Pterosaurs may actually thrive in this tropical paradise, and people may instinctively recognize that possibility. That makes the third point more likely: When someone sees an apparent pterosaur flying over an island of Hawaii, he or she will probably be more likely to accept that what was apparently seen was actually what it appeared to be. Last night I got a phone call from Les Kouke, who now lives in Colorado Springs. He had sent me an email, a few years ago . . . was living on the isand of Oahu, Hawaii, when he was twelve years old. It was around 1970 when he saw the creature flying about a hundred feet high . . .
Where was that flying thing [looking like a dragon] flying? Over Stansbury Island, which is in the Great Salt Lake of Utah.
. . . my friend that was with me immediately said “Is that a dragon! ?” It had a long tail, pointed wings straight to the side, short head. I thought it was a giant bat, but it would have to be the largest bat in the world.
. . . the bird (?) I saw was much bigger and looked like a pterodactyl. It now seems plausible that a species of ropen lives in Georgia [USA]. David Schroder has allowed me to reveal his real name.